You know that friend on your Facebook feed that's always like, "Look at me! I've got a new blog post!" or "Look at me! I'm hosting a Periscope chat this evening!" or "Look at me! I'm working on a new e-course!" Yeah, you heard me. I'm talking about that friend, the one who is always promoting her projects and trying to tell you about all of the exciting stuff she has in the works. I mean, just -- ugh, right? Well, before we begin spiraling into fits of rage over the sheer vanity of this vermin of a person, I feel like I should probably go ahead and state the obvious: I am that friend. And solopreneuers -- well, we're maybe a little annoying (sorry, fellow solopreneuers). Not only have we created this nonsensical title to describe what it is that we do, but we also seem to spend every waking moment yammering on about the things we are working on. It's virtually all we can talk about, especially on social media. On top of that, the fact that we exist outside of the traditional workforce means that no one seems to "get" what it is that we do. And Lord knows there is nothing more infuriating than mystery. While the rest of the world posts pictures of their dogs and their breakfasts online, we're posting pictures of our workspaces, sharing our e-books, and spreading the word about our upcoming webinars. Bluh. We're sorry, but we *have to* self-promote (even though we Often feel gross about it). Most brands have a marketing strategy, and usually the execution of this strategy is carried out by an entire department, a team of people who tell the world what this business is all about. But for solo-peeps (I'm done writing solopreneuer. Way too hard to spell), that responsibility falls on just one person. And actually every responsibility falls on just one person. Look, we're not looking for your sympathy here, friends. Or well, actually, maybe we are. Really, we just want it to be understood that if we didn't have to, we wouldn't be gabbing on social media all the time about what we've got going on. If potential clients could simply learn about us through osmosis or telepathic communication, that would be our go-to marketing strategy. But unfortunately, when you've been doing this for long enough, you start to realize that no one else is going to pedal your products and services for you. You've got to be a bit of a hustler, so to speak. And I'll be the first to say: this can make being friends with a solo-biz-human kind of eye roll inducing. An example of this: I recently went to a wedding with people I hadn't seen in a while, and every. single. person. there asked me about "Do The Damn Thing" (my new e-course). While I found it so sweet that everyone was interested, I couldn't help but think about the fact that the only reason they knew about this event in my life was because I had flooded their social media feeds trying to promote it. Eeeeek, sorry, guys. But hey, it's the nature of the solo-biz beast. And I hope you'll give me (and others like me) a pass. We really like what we do. Even though every aspect of business falls on us solo-peeps, the truth is: we wouldn't want it any other way. Speaking from personal experience, I love being a shapeshifting renaissance business lady. I enjoy working funny hours and not having to talk about the weather with someone whenever I get up to get a cup of coffee. I delight in working on weird projects that no sane employer would ever assign anywhere else. I love how when one thing isn't working, I can just switch gears at the drop of a hat, and my boss always approves (because my boss is me, and I tend to have a pretty go-with-the-flow attitude when it comes to my employees). The benefits of solo-biz life are apparent: flexible hours, creative freedom, pants optional. And to our friends, we just want you to be excited for us on that front. But sometimes we fantasize about nine-to-five employment. The other side of the solo-biz life is that it can sometimes be nightmarishly exhausting. In busy seasons, the wonderful aspects of the job (no boss, no set hours, no restrictions whatsoever) become the downfalls. Without fellow employees to pick up the slack, everything falls on you: making dumb graphics, scheduling dumb social media posts, researching dumb fixes to dumb technological problems (you may have noticed me using the word "dumb" a couple of times here, and I'm sorry for that, but these are just parts of the job I really don't enjoy). And without set hours, work life and home life and social life all blend together like some weird, hazy black hole of work and play. That said, I literally sometimes fantasize about having a job with a little more structure. I picture myself sorting a bin of tomatoes into two piles: good and not good. I only have to make one decision. I only have to worry about my tomatoes. And then when five o'clock rolls around, I punch my time card, and I'm done. Completely done for the day. Perhaps after work, I'll meet a friend for a drink or pursue one of my many hobbies (what's a hobby?! My work is my hobby!). So friends, when the solopreneuer in your life says, "Hey, thanks for the invite, but I'm really swamped right now," know that they are really telling the truth. And know that sometimes they fantasize about sorting tomatoes. I mean, who doesn't, though? We do have "real jobs" and we're tired of having to justify it (but also, we get the confusion). Let's be honest: if you're not in someone's industry, you likely don't fully "get" what it is that they "do." You just know that they're employed in some way and you are familiar with some of the details, and as their friend, that's good enough for you. You don't force them to provide an in-depth description of every aspect of their workday and list out each and every project they are working on. That would probably be pretty boring for you. Instead, you just listen as they complain about their crappy boss, and then you talk about Gilmore Girls. That, as far as I can understand, is friendship. But as a solo-biz-type, it's not always that easy. Because the idea of working for yourself is a little less common, the gap of understanding is both alluring and suspicious. I get asked fairly regularly to describe my workday, to give the play-by-play of how I while away the hours. I've also had friends who have actually stated, to my unblinking face, that I don't have a "real job." And in some ways, it's honestly understandable. I do a job that's a little off-the-beaten path, and it's natural that people have questions and preconceived notions about who I am because of it. But here's the truth: a lot of my workday is as boring as anyone else's. I answers emails. I draft blog posts. I consult with different people. I research. I meet deadlines. I schedule. I make calls. I drink coffee. I'm basically Dilbert. And if you're one of my fellow solo-biz peeps, perhaps your day is boring too. Or perhaps it's way more fascinating, and good for you on that front. But either way, to our friends, we just want to say: even though what we do is so wrapped up in what inspires and interests us, we are more than our jobs. We're happy to tell you about what we're working on, but we're also happy to tell you about our thoughts on art, music, literature, and the most recent episode of The Bachelor. We're that complex. THANK YOU FOR NOT HATING US! All in all, friends and loved ones of us solo-biz-bizzers, we mostly just want to say THANK YOU. You put up with a lot of weirdness from us because we are, by nature, a bunch of weirdos. It's the truth. What we do is tough, bizarre, wonderful stuff, and you are right by our sides supporting and loving us through thick and thin. And that's just super cool of you. 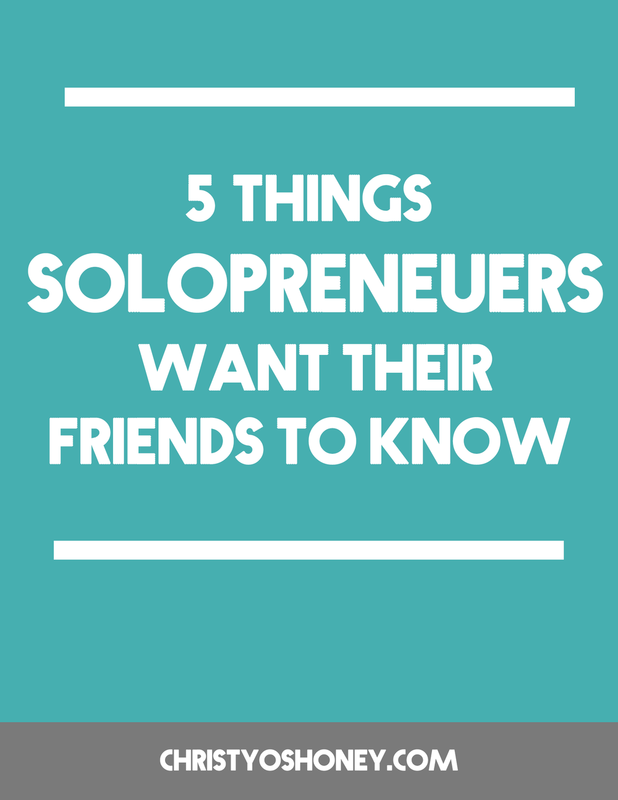 Are you a solopreneuer (or do you know one)? What would you add to this list?